High On Life: The Divine Boyhood, Reviewed. 1. Boyhood makes you want to protect—to save—everyone onscreen. They're not in any sort of peril, at least not plainly so; there are alcoholic dads and neighborhood bullies and some broken hearts, but no one's ever in any danger of being attacked by a bear or anything. But without ever seeming to try, Richard Linklater's new film invokes such powerful reserves of empathy that you'll find your heart beating right alongside every character's. I've never seen a film that makes you feel more like you exist inside of it, that you are invested its world as much as you are your own. Because this is your world. Their lives are not yours. But they will feel as if you have lived them. 2. 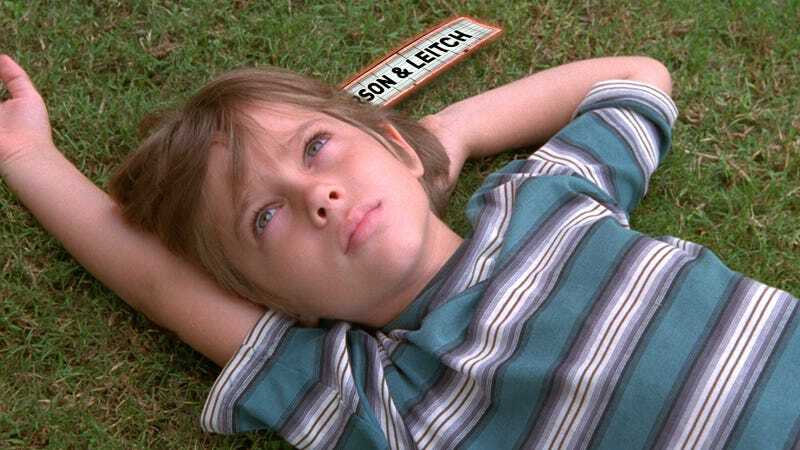 The "gimmick" of Boyhood is that Linklater, starting in 2002, began filming a fictional story of a six-year-old boy named Mason (Ellar Coltrane) and his parents (Ethan Hawke and Patricia Arquette), with a few scenes shot every year until 2013, when the boy left for college. This is an undeniably powerful concept—to watch a boy grow up, to see him age from a child gazing at the stars to an awkward, gangly teenager to a budding photographer and artist—but the concept is transcended almost immediately. Linklater wasn't just filming the story of a boy and his family over the span of 14 years. He was filming everything. 3. Thus, we have a quiet document of the last 13 years, the world chronicled in the background while life goes on in the foreground. Mason's mom struggles to pull her life together while raising two kids alone—Hawke's character isn't ready for the responsibilities of fatherhood, though he does have time to lecture his kids on war and politics—and meets a series of unreliable men who make her and her kids' lives that much more difficult. Just when she finally gets her life straightened out... the housing crisis comes and wipes out everything she'd worked for. The movie never dwells on any of this— there are no "I can't believe the Red Sox just won the World Series!" or "You guys, Michael Jackson just died!" artificial cultural signposts. (Though it does nail that specific brand of loopy, moony, now-sorta-dopey optimism many felt when Barack Obama emerged as a national figure.) But you feel the tug on every scene: The movie's world is keenly observed, capturing the universe in small moments, from Mason grinning wildly while picking up a copy of a Harry Potter book at midnight to two loved ones catching up on Skype, together, almost, not quite. The movie is organic: It breathes. 4. Yet life keeps taking turns. People pop into our lives, make a major impact, and then disappear. (One of the most quietly moving scenes involves Mason, as his family moves away, simply waving goodbye to a neighborhood friend, never to be seen again.) Mason's mom becomes an erudite professor with dinner-party friends, but then it all goes away, and then some of it comes back, and on and on she goes. His dad starts to pull his life together, in a way that's only partly too late, and you see him finding peace in the most unlikeliest of places, both for him and his son. And at the center of it all is Mason, a kid who we never quite figure out because no one in life gets figured out. He's just a kid, rolling with it all as it comes—he's aggressive sometimes, passive sometimes, kind at some moments, cruel at others. But there is a through line—he changes so much, but he's the same kid. We've seen it. We were there. 5. Linklater focuses solely on the tiny tempo of the day-to-day, steadfastly refusing "big" revelatory moments, but he also never gets bogged down in the banal details; he ends up elevating them into something almost divine. The world doesn't come at us in huge, galloping gulps; it absorbs into us, without us ever noticing, until it's almost over. The movie isn't as Here Comes the Big Cry as the trailer and the concept would make you think; it's far too smart and wise for that. Yet I still bet it makes you bawl your head off. Boyhood comes as close as capturing actual human existence as any film I've ever seen. It will feel like you have watched a full life, fully lived. And the best part: As the film ends, Mason's life is only beginning. Everyone's always is.